New Plans To Build 138 Apartments In Failsworth …. 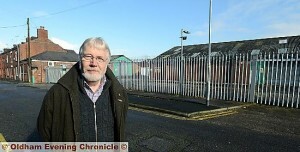 Parking concerns over dairy site. Plans to build 138 apartments on a derelict Failsworth industrial site have been welcomed by locals, despite fears of parking congestion. The proposal is to build a six-storey apartment building and 19 townhouses on the former Express Dairies site in Ridgefield Street, which has been disused for more than two years. There would be only 63 residents’ parking spaces and storage for 30 cycles for the 42 one-bedroom and 96 two-bedroom flats, while each of the three-bedroom houses would have two spaces. The developer intends towork with the council to promote public transport, walking and cycling. Current residents have given the plan — from Failsworth Site Ltd — a generally positive welcome. There will be two access points to the site, from Ridgefield Street and a new one in Brookdale Street. Barry Thomason (68) has lived next to the site for 46 years and he is in favour of the plans, but says 157 new homes will offer potential parking and traffic problems. “I think it’s a cracking development,” he said. “The site has been unused for around two and a half years so it really could do with being utilised. Oldham Council is very pro housing at the moment, which is a great thing. “A potential issue could be congestion and parking though. There are already delivery vehicles up and down the street all day from a mill opposite the site which is home to a number of delivery companies. That is on top of the residents already here. Businessman Lee Burnham will need to relocate if the plans are approved. His company UK Workbenches Ltd has used a building on the site for the last three and a half years. This will come at some financial cost to Mr Burnham, who got a good deal on the lease because the building wasn’t in good conditon, Since then he has spent up to £40,000 on it. Mr Burnham said: “This would have a real impact on us, financially. We would obviously have to move on, which will lead to a disruption in trade and there will be moving costs.